So, as a bit of an update, I’ve been living for the past year in the middle of the M Streets on Lower Greeville Avenue in a building called The Bella Villa Apartments located at 5506 Miller Avenue. 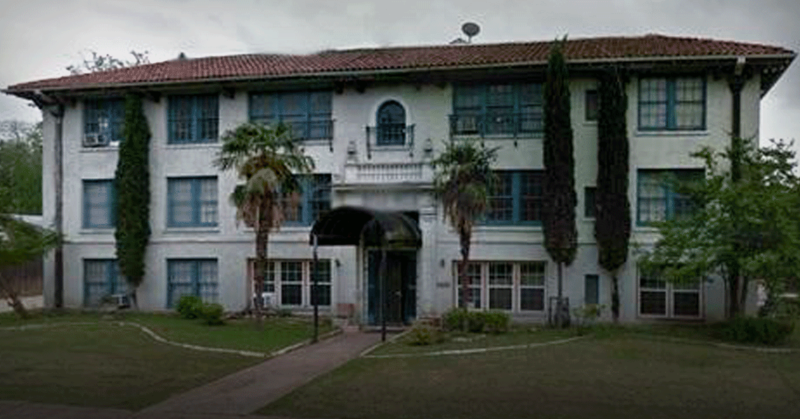 Apparently, the building was built in 1927 and is believed to be one of if not the oldest apartment building in Dallas. Over the years, this place has been a harbor for a mix of paying tenants, homeless transients, drug users, and partying college kids. Having lived up and down Greenville in many places over the last three decades, I had been well aware of the building and every time I happened to pass it, I found myself attracted to it for its creepy allure. The place looks like something out of old Hollywood: a sky-blue three-story building adorned with towering bent palm trees that seemed to be suffering from perpetual hangovers. The owners have obviously cared little for this grand slice of history, having let it fall into neglect and disrepair over the years. When I took over my month-to-month lease on October 1st, 2016, the place was being managed by an aging on-site leasing manager and his small posse of mid-aged speed freaks. It seemed every person I met worked “for the building” in one capacity or another and were having their rent subsidized by the pittance of work they did sporadically around the property, many times between 2 and 5 AM. It literally took the entire year of complaining to finally get the California-based company to evict the couple selling drugs in the unit above me and get the remaining deplorables out of the building. In the last two months, the place has been purchased by a new investment group and has been designated by the city as a protected Dallas Landmark. They will be gutting the entire place to fix the foundation, the leaking roof, and replacing all the interior walls, ridding the place of the black mold and asbestos that is encased in its bowels. And, I’m sure, they will be raising the rent at least 100 percent. It will take about 12 months, and once the work is done, this place will definitely be outside of my financial reach. Oh, well. Such is life. Nevertheless, I feel this building and whatever resides here will miss my particular brand of empathy where its concerned, especially considering the millennial complacents who are bound to inhabit its walls for the next 90 years. 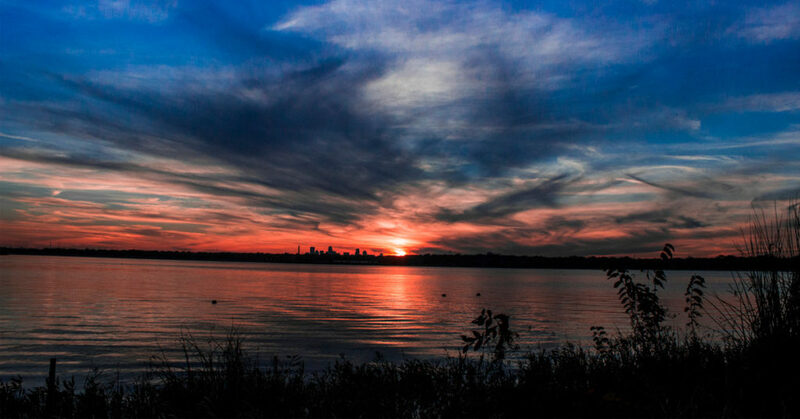 Or maybe it’s just my artistic hubris… It’s hard to know for sure. Speaking of sprawling stories, the preceding rambling preamble brings us to the true focus of this post. While surrounded by boxes and moving paraphernalia, I decided to start my Halloween countdown early this year. So even though I’m in the thick of packing to move from my creepy David Lynchian abode on Miller Street, I’m watching the backlog of horror films, both new and those I’ve vetted over the last few weeks in my quest to see one horror film a day until All Hallow’s Eve. So join me, if you will, on my journey into the macabre. 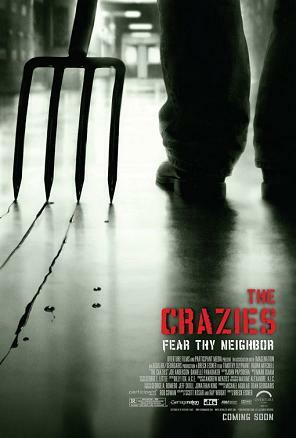 Our first installment this year is THE CRAZIES, the 2010 remake of the 1973 movie about a small town eviscerated by the accidental release of a powerful military-produced biological weapon that turns the inhabitants of a sleepy mid-western town into, well, murderous CRAZIES. The remake was directed by Breck Eisner and the original by horror master George R. Romero. It stars Timothy Oliphant and Radha Mitchell. The heroes of the story are local sheriff David Dutton and his pregnant doctor wife Judy. When a baseball game is interrupted by a feverous intruder walking onto the field with shotgun in hand, sheriff David is forced to shoot the man dead to save his life and those of the spectators. Thus begins a runaway train of cat and mouse, our heroes and a few others trying to keep away from the infected and the armed military personnel who are equally dangerous. And you can imagine, hilarity ensues and the body count rises. We find out that miraculously David and Judy have not been infected, but the danger is only beginning as friends and foes alike turn murderous in every direction. As our heroes speed away from town, a verbal countdown can be heard over a stolen walkie-talkie as that culminates in a massive nuclear explosion that vaporizes the town. The two scramble out of the wreckage of the semi and stare back at the glowing embers of their once-beloved town as they hold hands in the orange dusk. The last shot is of the couple walking hand in hand across miles of cornfields with the metropolis of Cedar Rapids, Iowa looming in the distance. The camera pulls back and vaults into the air as we see through the digital eyes of a satellite as a readout flashes across the screen: Population 128,056. Initiate containment protocol. The screen cuts to black. It’s a surprisingly intelligent reimagining of the zombie genre and the acting is fairly impressive. The art direction is impressive, relying on practical gags and a minimum of CGI to tell a nervously enjoyable story. Good start to a great season. René says: check it out.